Update, Sept 26, 2018: Annemiek just won the World Championship in the time trial for the second year in a row. With an impressively convincing win in the final time trial stage, Mitchelton-SCOTT’s Annemiek van Vleuten secured a second successive victory in her home UCI Women’s WorldTour race – the 21st Boels Holland Ladies Tour on Sunday 2nd September, 2018. #BLT2018 @AvVleuten does it again! It was an intensely satisfying week for the thirty-five-year-old from Utrecht who, as well as retaining the orange winner’s jersey, enjoyed two time trial stage wins and a road stage victory. In a dominant home performance, she also won the Mountains and Points classifications. 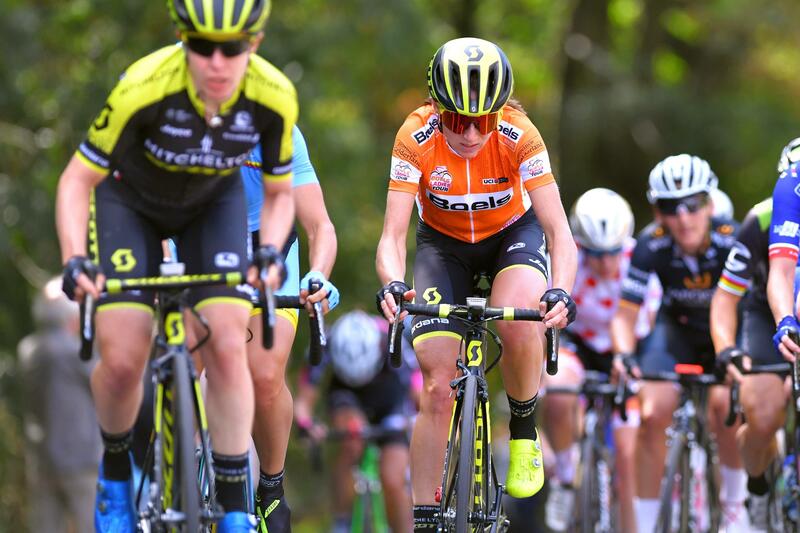 Leading from start to finish to win the prestigious Dutch tour title, by a margin of 52 seconds, also keeps on-form Van Vleuten on top of the 2018 UCI World rankings. 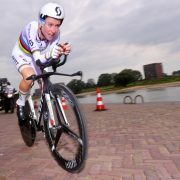 The flying Dutchwoman, sped around the final technical 18.6km time trial course in Roosendaal at an impressive average speed of 46.5kph (cadence average: 93rpm) to win the stage by 22 seconds from European champion Ellen van Dijk (Team Sunweb). “The race planning was spot on and I was in great shape, but the big difference from previous years is that we, as a team, can really compete for the overall win. The team assisted me very well and I knew that I did not really have to ever get into trouble myself,” Annemiek said after her race victory. She also understands that this Dutch race historically plays an important role in the preparations for the World Championship at the end of September where Annemiek will defend her World time trial crown. 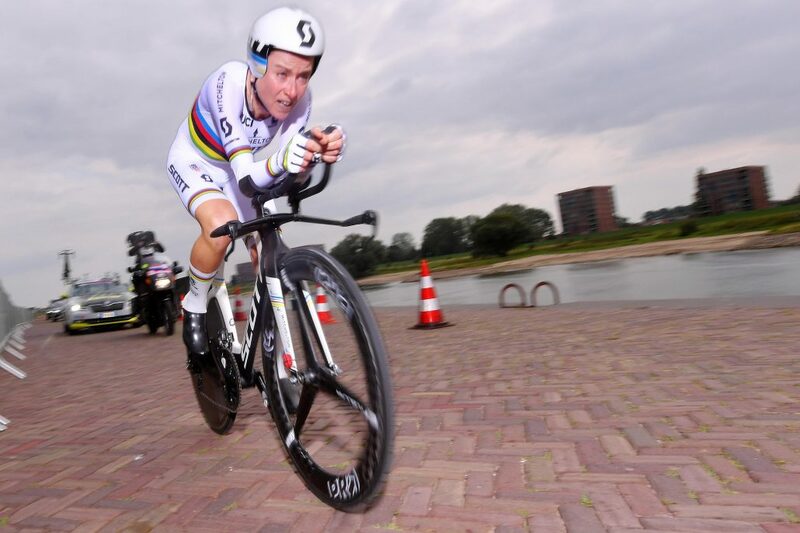 The six-stage Dutch tour started perfectly for Annemiek who, resplendent in her rainbow-striped skinsuit, won the short 3.3km prologue in Arnhem by the relatively large margin on seven seconds averaging 45.3kph. Annemiek then proceeded to solo to victory – with 20km to go – in the first road stage around the hills to the south of Nijmegen winning by 12 seconds despite riding briefly off course close to the finish line. Stage three ended in a bunch sprint with Annemiek safely in the peloton and still in orange. On stage four she lost six seconds of her lead to Lucinda Brand (Team Sunweb) with the queen stage to follow the day after in Limburg. Strong riding by Annemiek and her Mitchelton-SCOTT team meant she retained the leader’s jersey on the tough 158km Limburg stage and went into the final time trial stage with a 22-second cushion over Brand. With Brand crashing and having to change bikes, during the final time trial (which dropped her out of the top ten overall), it was Van Dijk who secured second place in the race behind Annemiek. 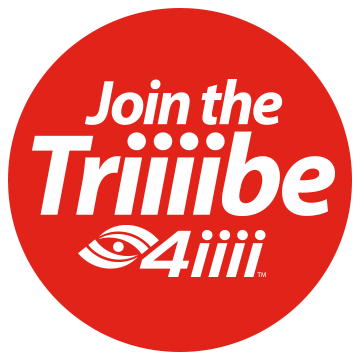 We wish Annemiek a very successful training block prior to the Innsbruck Worlds and also success to the rest of her 4iiii-supported Mitchelton-SCOTT team.